I made the claim earlier this season that Brett Gardner is an elite player, and it was met with mixed reactions. Some agree that Gardner’s decent hitting and great defense make him great; others find the claim of great defense too steeped in his great UZR. But now, courtesy of Brian Cashman, we have a suitable point of comparison from a person in a position of baseball authority. Carl Crawford was a four-time All-Star with the Rays and a gold glove winner. No sane person would argue he wasn’t an elite player with the Rays. It isn’t difficult to see the comparison. Crawford was a medium power player with blinding speed who flashed perhaps the best left-field glove in the league. 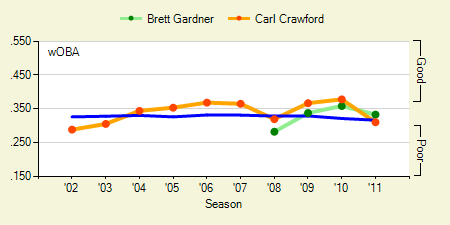 Gardner hasn’t shown the power that Crawford does, but his walk rates are nearly five percent higher. Overall, Crawford is the better hitter, but not by much according to wOBA. So far, Crawford has been slightly better on a yearly basis (until this year), although when we account for the rough environment of Tropicana Field, the gap widens (139 wRC+ to 121 in favor of Crawford in 2010, 123 to 100 in 2009). And this year? Not much of a contest. Crawford has had a well-documented struggle, with an 89 wRC+, and although Gardner hasn’t hit quite as well as he did in 2010, he’s still been above average, posting a 106 wRC+. One of the most common criticisms leveled against Gardner is that he’s “strictly a platoon player.” It’s true, Gardner has been protected from left-handed pitchers by Joe Girardi — he’s only seen 120 plate appearances against them, and he has a lackluster 83 wRC+ against them. But the only difference between Gardner and Crawford in this sense is that Crawford’s managers never benched him against lefties — typically, with the (Devil) Rays, better alternatives didn’t exist. Crawford has only topped a 100 wRC+ against lefties three times in his 10-year career, falling below 60 an equal number of times. His career mark against lefties? An eerily similar 82. 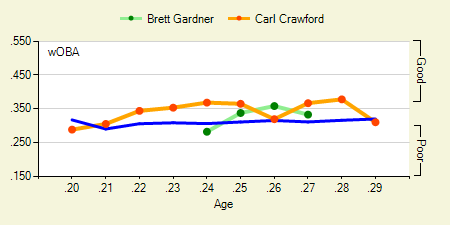 Basically, Gardner isn’t quite the hitter that Crawford is, and he possesses largely the same flaws. According to the defensive metrics, he’s one of the best fielders in the game, much like Crawford was in his heyday. But this defensive reputation is not completely based on the defensive metrics available at FanGraphs. Watch the plays he makes. Listen to the people in the industry. WAR has its flaws, but calling Gardner elite is not one of them. He’s a good hitter, a fantastic fielder, and a great baserunner. And even though his greatness doesn’t manifest itself in the way that gets play on highlight shows or sports radio, that doesn’t mean he isn’t great. And it most certainly doesn’t mean he isn’t considered great by those inside baseball. We hoped you liked reading Cashman: Brett Gardner Is Our Carl Crawford by Jack Moore! He did walk considerably less this year. If that’s his true talent, I’d be hesitant to call him elite, but that’s just semantics. Regardless, no one in the world would rather have Crawford and his paycheck over Gardner and his.